HARDEMAN COUNTY, Tenn. — Visitors experienced a journey through Bethlehem as residents celebrate Christmas with a special holiday event. 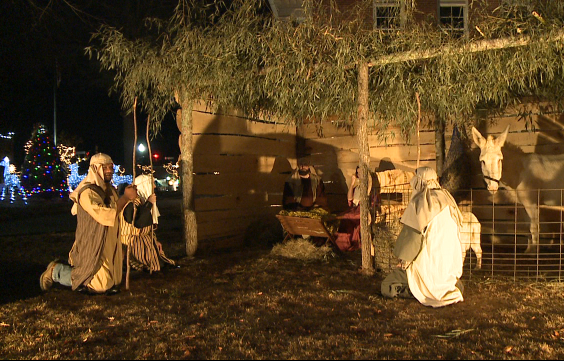 For the first time ever, Hardeman County leaders hosted a unique live Nativity, right on Main Street. The spirit of Christmas filled the air Monday as county officials began the weeklong live Nativity. Organizers set the scene on the court square for all to see. “It’s a historical event that had happened 2,000 years ago, and it’s just a great witnessing tool for the people of Bolivar and Hardeman County,” visitor Danny Davila said. “We used to have a Santa house on the square and they moved it to another location this year, which opened up a great opportunity to put the live Nativity scene on the square,” County Mayor Jimmy Sain said. The Nativity scene recaptures the birth of Jesus Christ. “Celebrating Christmas, the true meaning of Christmas, and this is what it is,” Davila said. Live animals were also part of the scene, representing the various animals present for Jesus’ birth in Bethlehem, along with local elected officials playing shepherds. As visitors viewed the live nativity and drivers passed by the court square, Mayor Sain said he hopes it serves as a reminder for why Christmas is celebrated in the first place. “Christmas has become so commercialized, and in Hardeman County we want everybody to realize what the true meaning of Christmas is and about Jesus’ birth,” Mayor Sain said. Mayor Sain says weather permitting, there will be choirs performing all week. If you missed the event Monday night, you still have a chance to see it Tuesday through Friday beginning at 7 p.m. each night.